We had a splendid meeting last night, with a welcome number of new faces appearing to add their insights and opinions. Much of our time was spent dealing with housekeeping matters to do with the Centenary Birthday Signs launch on Saturday morning. We will kick off smartly at 10am with a short speech about 1912 and the development of Grandview at that period, along with an appreciation of the particular houses we are celebrating that day. The formal posting of the sign will be followed by the presentation of a 100th birthday cake. We are hoping for a good crowd. Talk of planting a centenary sign outside Professor Odlum’s wonderful old house on Grant Street just behind the liquor store led to an interesting discussion about co-op housing in the neighbourhood and the fact that 2012 is International Year of the Co-op. 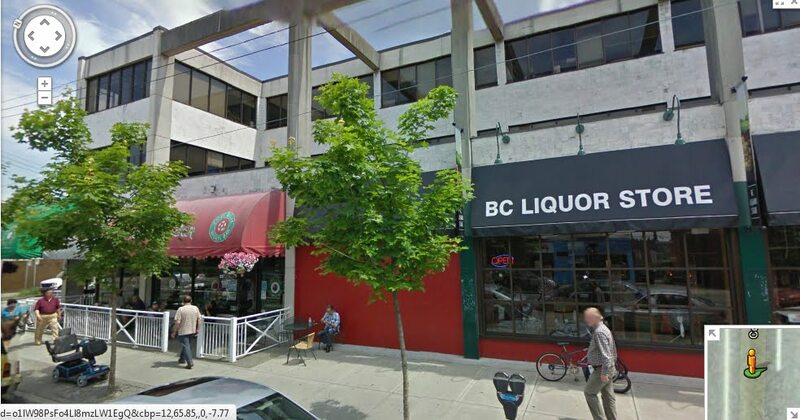 The co-op which has occupied the Odlum House since 1980 is having a celebration this Saturday evening. From co-ops, the conversation moved on to the current Community Plan process and the role that heritage may play in it. There was general agreement that the current and recent City administrations seem to be lacking in sympathy for heritage retention, and a number of ideas were floated that could improve that situation while moving forward on City priorities such as the Greenest City initiative. These included changes to the building code that would assist retention and renovation of older heritage houses (after all, the greenest building is the one that is already built), and innovative ideas for repurposing the hundreds of 1940s and 1950s “starter homes” in Grandview. Our members and others interested are encouraged to participate actively in the Community Plan process to ensure that our past is maintained as part of our future. We firmed up plans for our Walks and Talks series this fall and winter, and I’ll write up a separate post about those later today. Finally, in our usual glee for show and tell, Eric brought along another of his extensive collection of technical books from the early part of the 20th century — this one included surprisingly modern bathroom fixtures — and Ann showed us a wonderful cast made by a local metal workshop that she found in her house. 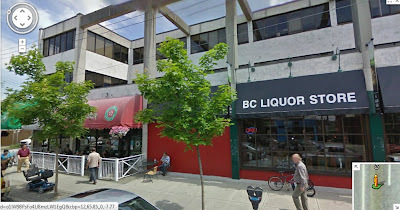 There have been a few explanations of the name of our neighbourhood or, rather — because the name is so obviously descriptive — the date and person who coined the name. In the 1920s, City Archivist Major Matthews noted that Prof. Edward Odlum, scientist and local realtor, always claimed naming rights. I have now found a report from 1911 which seems to substantiate the story. 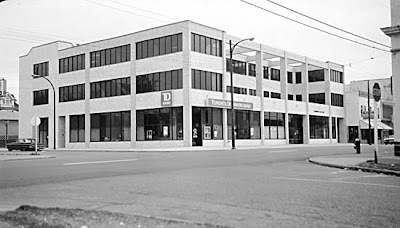 Odlum was a columnist for Stevens’ paper and lived at the corner of Grant &Commercial. 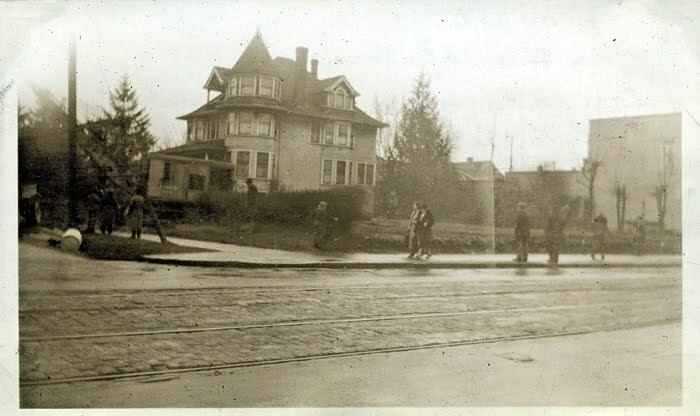 From the earliest days of Grandview’s development, the lots on the southeast corner of Commercial and Grant were owned by the Odlum family. Professor Odlum, the pioneering patriarch of the family, built himself a large house on Grant Street, leaving the lots along Commercial vacant, paying taxes on them and keeping them neat. In this late 1935 photograph taken by the Professor’s son Edward Faraday Odlum (and available courtesy of Ruth Raymond) the view is from the northwest corner of Commercial looking SE across the street. The Odlum house can be seen and pedestrians are walking beside the Odlum lawns on Commercial. The Odlums finally sold the lots at the end of 1935 and in January 1936 Signal Oil began excavating the lawns to prepare for the gas station they were going to build. In this early 1936 image (again from E.F. Odlum, courtesy Ruth Raymond), the photograph is taken from the Odlum House looking west. 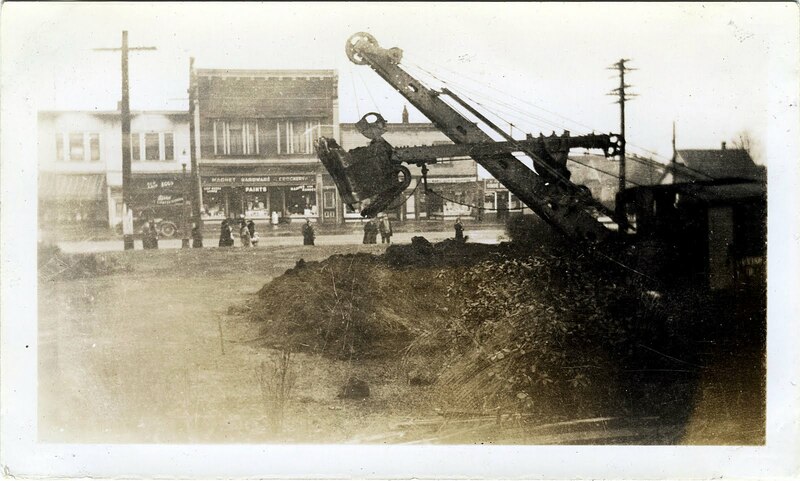 The stores are on the westside of Commercial and the machine can be seen excavating the eastside lawns. 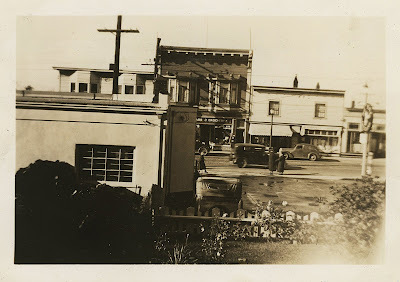 The Signal Oil gas station had its formal opening in May 1936. A year or so later, E.F. Odlum snapped another shot from his house, again looking west (once again we must thank Ruth Raymond for the image). The forecourt of the gas station can be seen beyond the wooden fence. There was a gas station on that corner — under various names and owners — until 1972 at which time the lot was completely changed. Quite the change from the quiet lawns of the 1920s and 1930s!